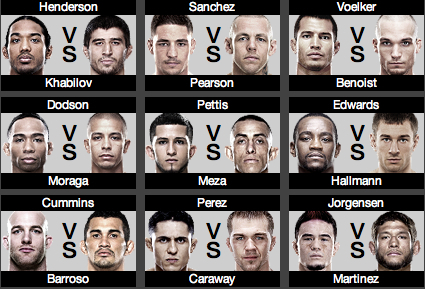 The 11-bout UFC Fight Night 42 Albuquerque card is now complete! The first UFC event to hit the state of New Mexico, is headlined by former UFC lightweight champion Benson Henderson’s bout with Rustam Khabilov, and Diego Sanchez’ homecoming showdown with Ross Pearson. Today, the card was finalized with the addition of longtime welterweight standout Jason High who will make a drop to 155 pounds when he takes on eighth-ranked contender Rafael Dos Anjos at the Tingley Coliseum in Albuquerque, New Mexico.